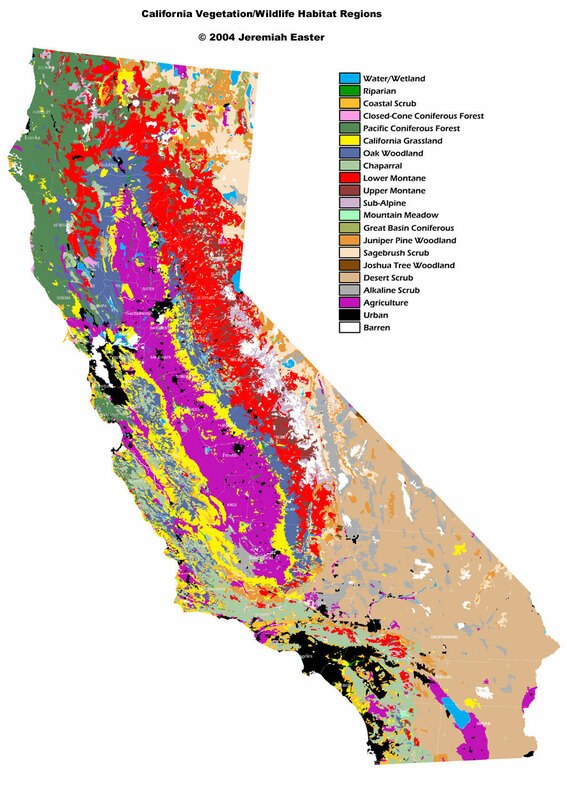 Bioregions (California Dept. of Forestry and Fire Protection, Fire and Resource Assessment Program) Statewide map of bioregion boundaries. California, An Environmental Atlas & Guide (Kreissman) 1991 (ref F 859 K74 1991) Collection of mostly state base maps that show boundaries, management areas, and facilities for federal and state agencies, universities, private organizations, and major physiographic and ecological features. Also has a directory of federal, state, and major private environmental agencies. California Natural Resources Agency Map Server Offers a variety of environmental resource-related interactive map services which can be viewed using such products as ArcGIS Explorer, ArcMap, ArcView, Google Earth, MapInfo, and World Wind. California Ecoregion Browser (California Information Node) Interactive map that displays and identifies USFS ecological subregions. Other base layers are also available for display. See Ecological Subregions of California for further information. California Natural Diversity Database (CNDDB) Quick Viewer (California Department of Fish and Game) Interactive mapper that lists all CNDDB species or natural communities that have been documented by the CNDDB to occur within a USGS 1:24,000 topographic quad. Can also create a county list. This list may include both recent and historical records. California Vegetation/Wildlife Habitat Regions (Easter) Classified into 21 classes. GAP Analysis of Mainland California: An Interactive Atlas of Terrestrial Biodiversity and Land Management (California GAP Analysis Project) 1995 (Atlas QH 76.5 C2 C34 1995 cd-rom) Database on cd-rom that provides an assessment of the conservation status of native vertebrate species and natural land cover types in California. Uses medium-scale distribution maps to show 300 dominant plant species, 200 plant communities, predicted distribution of 455 terrestrial wildlife species, 58 wildlife habitat types, and land ownership and management status. Will also display a list of rare or endangered species in a selected 1:24,000 USGS quadrangle. The interactive atlas allows one to make queries, displays, and analyses. Data can be downloaded in Arc/Info export format for use in a local GIS system. Data is available in statewide datasets or in subsets by ecological region. The cd-rom database and GIS coverages can be downloaded from the California GAP Analysis Home Page. Initial Assessment of the Health and Condition of California's Lands and Natural Resources (California Resources Agency) Includes an extensive collection of supporting maps. Level III Ecoregions of California (U.S. Environmental Protection Agency National Health and Environmental Effects Research Laboratory) Derived from the 1987 map by Omernik. Includes the descriptions of each Level III ecoregion that can be identified through the analysis of the patterns and composition of its biotic and abiotic phenomena (geology, physiography, vegetation, climate, soils, land use, wildlife, and hydrology). Wildlife Habitats - California Wildlife Habitat Relationships System (California Department of Fish and Game) Includes a distribution map for each of the 59 wildlife habitat types used in the California Wildlife Habitat Relationships System. Wildlife Habitats: Multi-Source Land Cover Data (California Department of Forestry and Fire Protection) 2004. Statewide and county maps that map the 59 California Wildlife Habitat Relationships System habitat classification system. Wildlife Habitats: Gap Analysis Program (California Department of Forestry and Fire Protection Fire and Resource Assessement Program) 2001. Statewide map of California at a scale of 1:1 million that classifies wildlife habitats using the California Wildlife Habitat Relationships System habitat classification system.